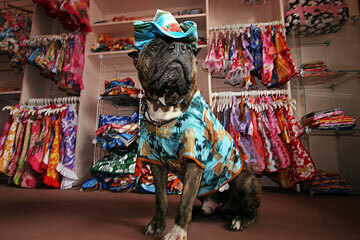 Monica Shigenaga, granddaughter of the founders of the former Kaimana Beach Hotel, believes there's a unique niche for high-end Aloha doggie fashions. We're talking about Aloha shirts for difficult-to-fit dogs like Dachsunds and muumuus and vests for larger dogs like Labrador retrievers, as well as bandanas, bikini tops, speedos and surfer shorts. 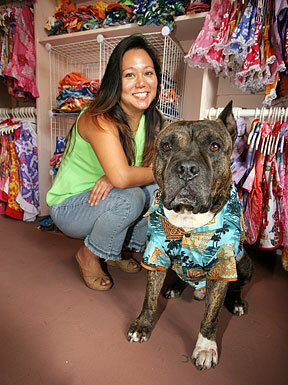 Sizes range from baby (smaller than XXS) to extra large (4XL), and prices range from $33 to $47 for Aloha shirts. Shigenaga considers it canine couture. Having spent five years traveling the world to market the Cocojor brand -- which comes from the names of her own two Staffordshire terriers Coco and Jordan -- Shigenaga is now setting up shop in Hawaii. 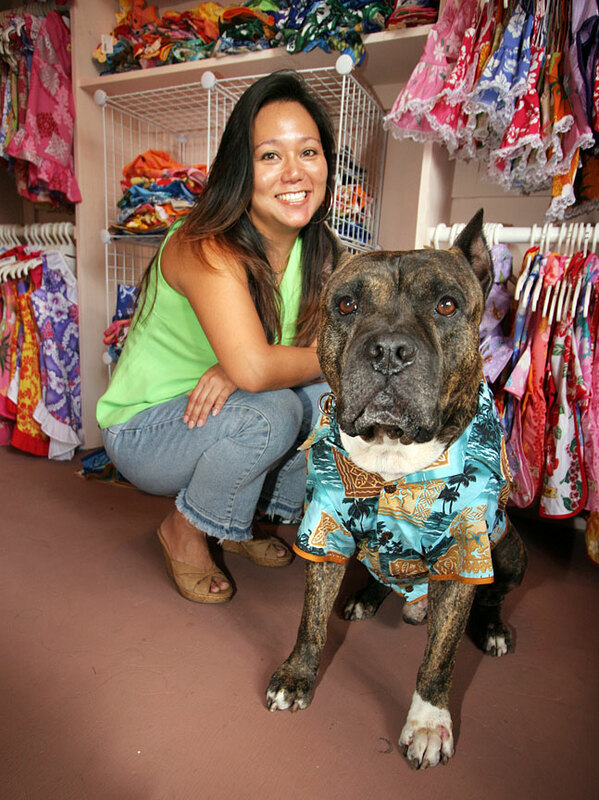 She's opened a flagship store at 905 Queen St., a 600-square-foot boutique called Kaimana Hale, which will feature all of her doggie fashions. Kaimana Hale is a tribute to her grandparents who opened the Kaimana Beach Hotel, which has since been sold and is now known as the New Otani. Shigenaga, who had trouble kickstarting the business in Hawaii five years ago, can now boast of a customer base that spans the globe -- from Hong Kong to the Great Britain. About 30 percent of her orders now come from Japan. While there are plenty of businesses featuring Alohawear for pets, Shigenaga may be the first to base an entire store on the concept. Given that past Cocojor clients include Hollywood celebrities like Nicole Richie, Tori Spelling and Carmen Elektra, Shigenaga feels confident in having established a brand reputation. Few lenders bought into her idea back in 2002, so she started the business with her personal savings. She traveled the dog circuits, promoted her Alohawear at trade shows, and got valuable exposure at Pet Fashion Week in New York. Her credibility has grown now that her dog fashions are being carried in high-end boutiques throughout the mainland, from Bark, Bath and Beyond in Laguna Beach, Calif. to Modern Tails in New York. Locally, Cocojor fashions are carried at Bark Avenue in Hawaii Kai, True Friends at Ala Moana Center and Hua Hua in Waikiki. 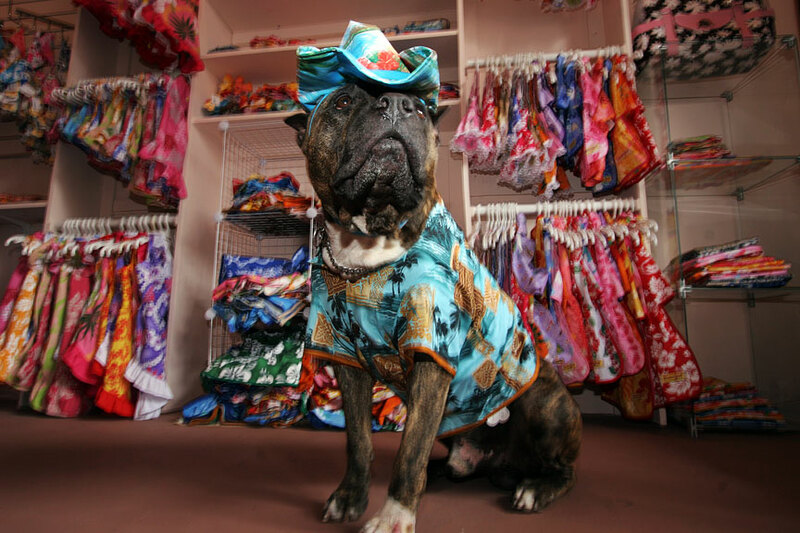 "Dog apparel is one of my biggest categories," said Heather Waldemar, manager of True Friends, which carries Cocojor and Hilo Bay Fashions, another local designer previously known as Doggie Bahamas. The Hawaiian prints are a hit with tourists shopping at Ala Moana because they want to take something home that represents Hawaii, she said. Though the Aloha doggie couture is designed in the spirit of fun, there's a practical side to the bikini bottoms and surf shorts, according to Shigenaga. She says they actually come in handy for dogs that are either incontinent or in heat. Shigenaga also offers a line of "cooling" couture -- suncaps and vests she said are made from non-toxic cooling crystals. Soak the crystals in water, and they will keep canines cool for one to three weeks. These vests are being worn by the Transportation Security Administration dogs at Honolulu International Airport. Prices for the vests start at $38. 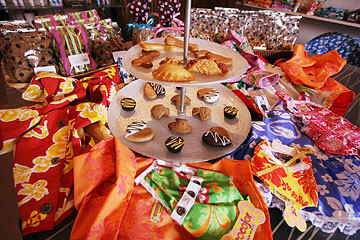 Cocojor Hawaii LLC is profitable, she said, though she declined to share revenue figures. The concept may seem frilly, but industry statistics indicate Shigenaga is tapping into a growing market niche. In its 2007-2008 National Pet Owners Survey, APPMA found that 46 percent of dog owners purchased canine clothing within the last year. People are forecast to spend an estimated $40.8 billion on pets this year, compared to about $38.5 billion last year, according to the American Pet Products Manufacturers Association. Across the nation, there are an estimated 74.8 million pet dogs. National retailers like Old Navy and Harley Davidson are launching their own lines of pet products, from pet shampoo to toys, attire and gourmet treats. Designers like Ralph Lauren have also gotten into the act, and it's not uncommon for high-end boutiques to carry designer faux mink coats and rhinestone collars for the pooches of fashionable shoppers. With Cocojor, Shigenaga is focusing on Alohawear to capitalize on the brand and image of Hawaii to the rest of the world. It's not priced as high as Ralph Lauren, but Shigenaga is targeting the high-end shopper, marketing her fashions as authentic Hawaiian-wear for dogs. All of the apparel, she said, is designed and manufactured in the islands.